For over 50 years, the American government, by using NORAD, has been tracking Santa on is important journey around the world. It has been a great chance to see how Santa manages to do deliver all the presents in such a short amount of time. It has changed over the years, with the invention of the Internet and more precise tracking technology to home in on Rudolf’s red nose. It gives off a strange radioactive trace that NORAD’s systems have been calibrated to follow. The service is monitored throughout his journey by volunteers as well as help from industry to keep the website up and running during his journey. First Lady Michelle Obama reacts while talking on the phone to children across the country as part of the annual NORAD Tracks Santa program. 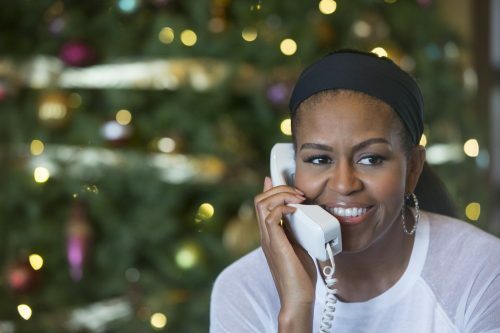 Mrs. Obama answered phone calls from Kailua, Hawaii, Christmas Eve, Dec. 24, 2014. It’s not only the website that is running through the journey but you can also call NORAD to ask them where Santa is as well as asking questions about the service. 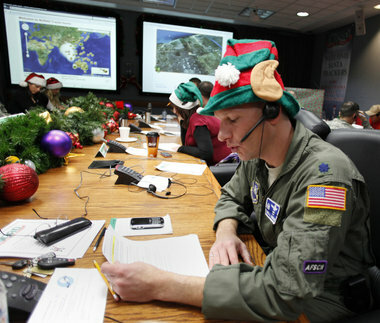 It’s not only NORAD staff who are on the phone. You could be luck enough to talk to the First Lady or a celebrity who also give their time to help children around the world informed about this important journey. The service started because of a misprint in a newspaper. It gave the phone number of the pre-cursor of NORAD, the Continental Air Defense Command, top secret hotline number instead of the Sears Roebuck & Co. The base wasn’t aware until the phone calls from children came in. Fortunately, for history, the commander, Colonel Harry Shoup, after he realised what was happening he got his staff to help all the children who called in with the information they were after. A tradition was born that is still running today. The only change is technology. It’s not only the traditional phone number but a website that also keeps the world’s children, of all ages, informed of where Santa is at any one time. Now you can also see Santa by using NORAD’s Santa Cam. It’s a great idea that I hope will keep on going throughout the decades as it’s great fun to see what route Santa is taking. Just remember to send your little ones to sleep before he gets too near to your house or he may skip over it because you will be naughty. As well as NORAD’s tracking, Google is also offering the service from its website. 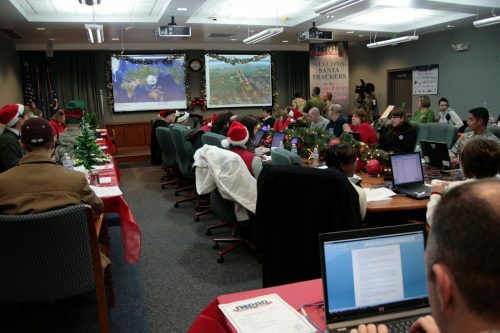 NORAD’s op center where volunteers and military personnel track Santa’s journey.